Most of my technical primers are…well, technical. This one won’t be because the problem is confusion rather than complexity. Failure to clean up (dereference) NULL pointers. In both cases, the mistake is made because they think dereference means to delete something, which it does not. In programming parlance, dereferencing means getting the value for something—a.k.a., reading it. 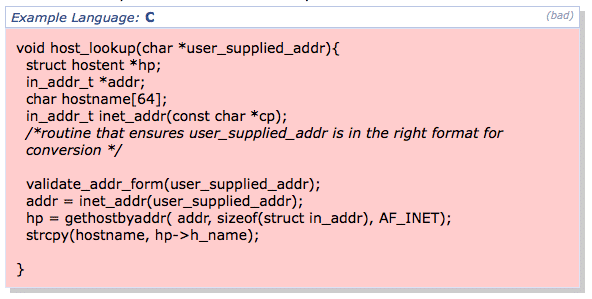 In other words, a Null Pointer Dereference Vulnerability just means reading a NULL pointer. It’s not about deleting references, or leaving references lying around, or cleaning up NULL pointers, or any of that stuff. Computers just hate trying to extract the value of things that don’t exist. And I can’t say I blame them. This is a fantastic explanation of pointers on Stack Overflow. Another interesting piece of trivia: Null Pointer Dereference and Null Pointer Exceptions (NPEs) are the same vulnerability with different names. Thanks to Jason Powell for talking through this, championing the cause, and reminding me that this primer still needed to be written.